We're building the future of communications. Would you like to join us? The companies based at Adastral Park range from the smallest start-ups to large, multi-nationals. We're a thriving community, working to drive the UK's digital ecosystem forward and we're looking for talented technologists to join us. Whether you're starting out and looking for an apprenticeship or graduate position, or you're already established in your field, there are opportunities for you. Innovation is in our DNA, and so this area is absolutely key to our business. Our Research and Innovation teams explore the many exciting ways in which we can meet the needs of our global customers now and in the future. As you help to develop the innovative solutions we seek, you'll build on your expertise in a specific field and, as your depth of technical knowledge grows, you'll become a consultant in your specialism, for people across the business. In some cases you'll be working on collaborative projects with other global research and technology organisations. Learn more about becoming a BT graduate. University is a fantastic way of starting a career in ICT, however it's not the only route. Apprenticeships are an equally valid way to get into the field at an earlier stage including working toward a degree. Around 50 apprentices are recruited to Adastral Park each year as well as graduates and management trainees. In fact, many of the senior managers working at Adastral Park today began their career as apprentices, including Professor Tim Whitley, Managing Director, Research and Innovation and Adastral Park Managing Director. As well as working on a real research project, technical knowledge, research and soft skills will be learnt on the job, and project work contributes to the degree. One of the main benefits of an apprenticeship is that you can earn as well as learn whilst creating your long-term career at one of the world's most pioneering centres of technical innovation. Find out more about apprenticeships. 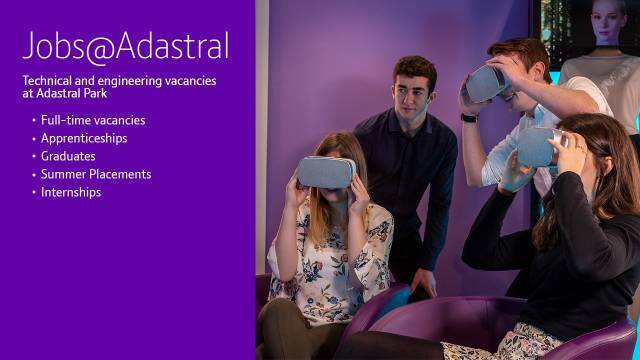 At Adastral Park we offer a host of work experience placements throughout the year, typically one to two weeks but sometimes spanning the whole summer. We help people aged between 16 - 24 and not in education, employment or training, to get ready for the world of work with a fully supported programme including coaching and on-the-job experience. With over 100 companies based at Adastral Park, there are often career opportunities and work experience available. We're opening our doors to the public to come and find out about the exciting career opportunities in technology available at Adastral Park!